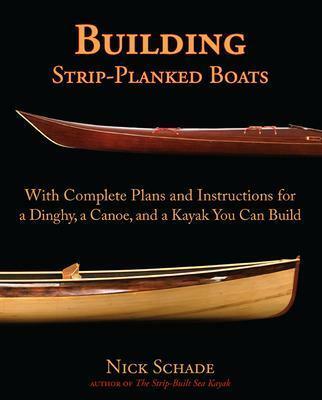 The Strip Planking method of boat building could be described as a form of carvel planking. However, using strips is a form of construction which is much more suitable for the back yard builder. Using this method a beautifully round bilged boat can be built with less skill and tools than with carvel. 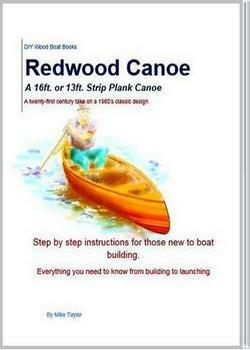 It requires a minimum of lofting, tapering of planks, and caulking. When strip planking first began to be used the strips were plane cut either square or oblong in cross section. Nowadays most home builders use the more convenient molded strips. The most common timber used is Cedar. However any straight grained wood can be used although it is best if it is knot free. Soft woods are preferable to hardwoods as they expand less and can absorb more compression. Plane square edged strips will be the simplest to cut or cheapest if buying ready cut. However, without any beveling this will leave open ‘grooves’ between the outer edges, especially where there are tight corners. These ‘grooves’ can be filled with epoxy, but this will add weight to the finished boat and it doesn’t look good. This can be overcome by planning the edges. Beveling the edges does require a deal of skill, especially as the bevels will have to vary as the curvature of the boat alters. This may be easier to do with a sander. With the cove and bead strips this problem is to an extent overcome. The cove will accept the bead even on tight curves ensuring a tight fit. And the process will be speeded up by the ease of locating and the need for fewer staples. However the molding will have to be paid for, in cash if you buy ready cut or in time if you make your own. And the outer edges of the strips on those tight corners will need quite a lot of faring to get then smooth. Rapid Strip is another molded form of strip plank which is becoming popular. It is so called because the tongue and groove molding allows for fast building. Or at least it will be fast if you are prepared to fill the grooves on the tight corners with epoxy. Using full length strips might result in a stronger construction. However, building with shorter strips will be easier. The ends of the strips will require some tapering and a precision fit. It will be easier to shape the end strips separately then fit a piece in between. Joints can be simple butts so long as the joints of successive strips are staggered. Unlike traditional boat building methods strip planking is done upside down on a jig. The jig is created by erecting molds on a strong back. The molds cut in the shape of the various sections are usually of some cheap material such as chipboard. The forms are temporary structures so their edges should be covered in polythene to prevent the strips adhering to them. However, internal permanent bulkheads may be erected in place of temporary molds. These are set up on the strong back, as are the internal keel or hog and the stem and transom. It is normal to begin the planking from the sheer and work upwards. However, strip planking can be started from the keel depending on the particular design. Planking which runs parallel to the sheer will look better if the boat is to be finished with the wood showing. And even when painted the planking run off might become visible with age. While starting at the sheer the initial planks will be easy to fit bit the bottom planks will need a lot more tapering to fit. Fortunately the use of epoxy will help reduce the need for an exact fit. If you are using epoxy glue when strip planking then nailing is not necessary. However, nailing will help to help to hold the planks in place and reduce the amount of clamping needed. Normally nailing will be done vertically through the strips. Thin gauge nails are countersunk and driven across three strips. Nails should be staggered across each three strip course by about six inches. Nailing in this way reinforces the gross grain strength and stiffness. Beware of nails running-off as they could penetrate the surface and cause a problem when it comes to finishing. Starting the nails with a pilot hole will help prevent run-off. Gluing is not necessary with a nailed strip construction however some protection against water ingress is needed. Whether or not you use glue between the planks will depend on the design, the type of wood and the skill of the builder. The most hyped method of gluing is with epoxy. However it must be remembered that epoxy is hard, unyielding and expensive. Using a more flexible compound will allow for swelling and movement. With so much gluing to be done, glue drip can cause problems when it comes to fairing. This can be minimised by using a thick glue which sets quickly. Any surfaces such as permanent bulkheads need to be protected from glue drip. Having completed the planking the business of faring will smooth out any ridges. With woods such as Cedar you will have to be careful as it is easy to fair away too much. Because Cedar is relatively soft it will need sheathing, other woods may not. Sheathing with woven glass cloth and epoxy will allow the natural wood to show through. Once the shell is finished the outer components such as the skeg and the wooden keel can be added. There are many advantages for the backyard builder with this method of building. However, strip planking is a relatively slow method of building despite the reduction in framing needed. Where a hull is sheathed with glass and epoxy inside and out it effectively becomes a core construction. Core constructions are by nature strong. However wood is not the ideal core material as it is porous, unstable and subject to rot. Any breaks in the protective sheathing can lead to devastating results which are difficult to rectify. But a well built varnished strip planked hull will look wonderful.